Reflectors. Please. 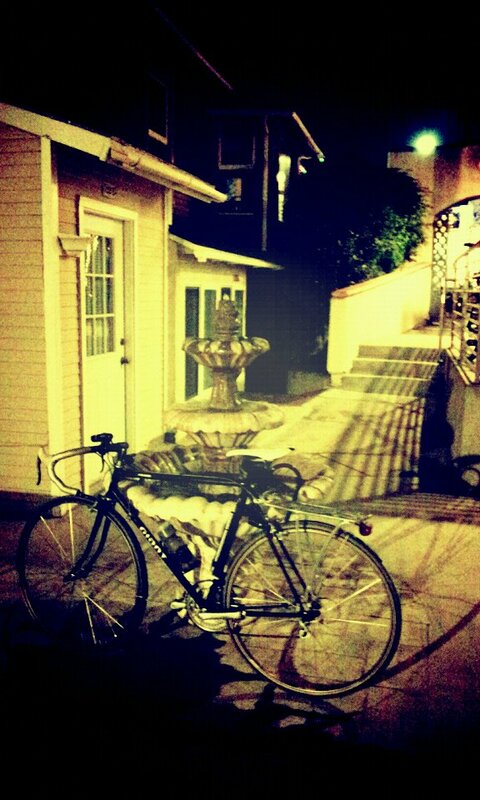 : Bikes. Rants. Adventures. I had a lovely ride home. It's winter in Southern California, which means it's actually cool enough outside to ride without breaking a sweat (read: 50 degrees) and the bike path that I take for most of my commute is generally void of the general touristy crowd that tends to cluster on the path during sunnier times. It was pleasant, quiet, peaceful. Then I almost hit someone. Five someones, actually. It's one thing to ride without lights. It's another thing to ride without any sort of reflectors whilst wearing all black, on a trail that isn't lit, where many commuters are traveling at high speeds. Thankfully, no one died (or even got hit, for that matter) though words were exchanged...or, words weren't so much exchanged as they were given. Angrily. I always feel like a grumpy old man out on rides. "You needta getcher selves some lights, mmkay? Damn kids!" Probably this is what I'll sound like in fifty years or so, if I don't crash into a lightless bike ninja and die from the trauma before then. And speaking of bike ninjas...holy crap, Yehuda Moon is back!! Finally, I have today's photo from Project 366, which I'm taking part of. I stopped to pose my commuter, Se7ven, against a backdrop of a coffee shop, fountain, and the moon. The gears make this considerably less hipster.